Why are we conducting this Capital Campaign? First, to retire the current church debt; Secondly, to address and repair present issues with the roof, flooring, parking lot, and areas that need to be painted; Thirdly, to invest in the future of our church by improving our facilities and our financial stability. How was the Capital Campaign approved? The Board of Trustees researched and determined what was needed to make repairs around the church campus so that it remains structurally sound and attractive. The use of funds to make repairs ensures that the Lord’s work has a home at Pittman Park for years to come. The Capital Campaign was then approved by both the Finance Committee and Church Council. Why did we see the need to hire a consultant? Our church has retained The Rev. Dr. John Hewett, a professional consultant who works with nonprofits nationwide to assist with capital campaigns. Our PPUMC leadership concluded that this project was too important and complex to attempt without professional guidance and experienced help. The use of professional consultant services can increase giving by 50-100% (or even more) over pledges raised solely from the pulpit and such increased giving more than pays for the flat fee charged for John’s service. How much is the consultant being paid? A flat fee of $34,000. Why was the Capital Campaign goal set at $900,000? The Board of Trustees looked at PPUMC’s current and future needs and received bids for repair, renewal or replacement. Items were ranked in priority as to importance and/or critical need. The attached form shows the items in rank order. Where would $900,000 be spent? See Attachment: 1a. What are the projects in order of priority/ importance? See Attachment: 1a. What if greater needs arise prior to the completion of the projects? These projections have been carefully considered by several committees of the church. The list could certainly be modified if there was a critical need not already on the list. The Board felt that this list covers all areas that need attention to date. When will the projects begin? The projects will be handled as resources become available and in the order of importance indicated on the attached list. Is the loan/note for our present debt $250,000 coming due? Can we negotiate with the bank(s) for a lower interest rate on our current note? Will we incur a penalty for early retirement of our original note? We are under no immediate deadline in regard to our current debt - which has now been reduced to $219,000 through regular monthly giving by our membership. While it is always possible a lower interest rate could be found, our Finance Committee feels this loan is at a very competitive rate. Our first priority in this capital campaign would be to retire this debt as soon as possible in order that we would be debt free. There is no penalty that would be levied for early retirement of the loan. If we exceed the Capital Campaign goal, who determines how the additional funds will be allocated? The Church Council in consultation with the Board of Trustees and Finance Committee would guide the use of any additional resources. Since these monies will have been given for the purpose of repaying debt, repairing church property and renewing us in the work of mission and ministry, the Church Council will honor these intended purposes. If the cost to replace the roof exceeds the estimated cost, what then? The Board of Trustees roof replacement costs are based on current estimates from roofers. If repair costs exceed estimates, the Board of Trustees in consultation with the Finance Committee will have flexibility to adjust the amount allocated for each project. See Attachment: 1a. What effect will paying off our current debt have on the budget? Paying off our debt will give us opportunities to grow the ministries of Pittman Park UMC. Missions, community outreach, children and youth activities could be expanded. What are some ways in which I can give? There are many ways to share your gifts. Your prayers and your talents are one way to share your gifts. Financial gifts in the form of cash, checks, one-time gifts, pledges, legacy gifts, life insurance, real estate property, stocks and bonds are all appreciated. Any early gifts will assist in our financial planning. All gifts will be accepted and utilized. Is this gift in addition to my pledge to our annual stewardship/budget of PPUMC? Yes, in fact it is crucial that this Capital Campaign not impact our normal operating budget at Pittman Park. We encourage gifts to the capital campaign to be made over and above regular giving to the ministry budget of our church. Will my giving be confidential? As with all giving at Pittman Park, contributions remain confidential. Am I going to be pressured into giving to this Capital Campaign? All gifts given are between you and the Lord. How long do I have to fulfill my pledge, and what happens if I am unable to fulfill my pledge? This campaign is set up so that pledges will be received over the course of three years. While it is our hope that three years gives ample time to fulfill your pledge, we understand that unforeseen things happen in all of our lives. You will be supported, valued and loved even if circumstances make it necessary for you to reduce the amount you originally pledged. How will these projects impact our church and our ministry for good? It is our prayer that our facilities will be more functional and presentable so that our church home and it’s ministries are preserved for future generations. When will we be asked to make our financial commitments? Although commitments can be made at any time Commitment Sunday is scheduled for October 30th, 2016. Is this campaign spiritually based? What is a Capital Campaign and how is it different from our annual pledges? Your annual pledge helps maintain the current level of church operations, including staff salaries, utilities, missions, and maintenance. Our pledge drive is ongoing. 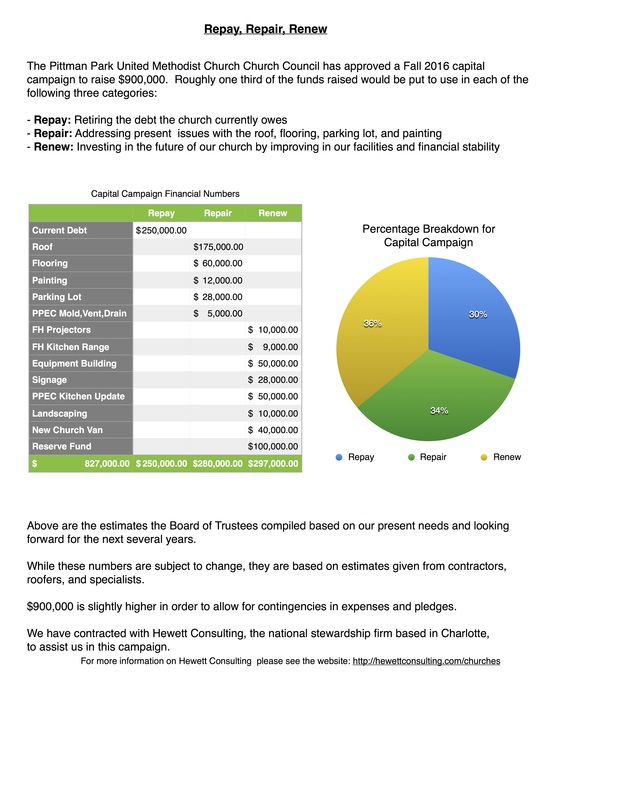 A Capital Campaign is an intensive fund-raising effort designed to raise a specified sum of money within a defined period of time to meet the varied asset-building needs of our church. In our case we are raising funds to retire debt, to insure the structural integrity and beauty of our existing building and to renew ourselves in commitment to help Pittman Park be a strong church in ministry and mission as we move into the future. What if I am already giving as much as I can to my annual pledge and cannot afford to give more to the Capital Campaign? In determining whether or not to contribute to the campaign, it is important to not only consider the importance of Repay, Repair and Renew to us individually but to the larger church community. The success of this Capital Campaign provides the church with the opportunity to extend PPUMC’s outreach at a local, national and international level. While we know that many of you are already giving, we ask that you reflect and determine whether you are able to extend your generosity. That being said, a family or individual already giving at maximum capacity should feel great joy. Are my gifts to Repay, Repair, Renew tax deductible? Yes, all gifts to Pittman Park UMC are tax deductible. We have before us a vision of several challenging projects: to repay our debt in order to free God’s resources for mission; to repair our building – particularly our roof – in order that this can continue to be a beautiful spot from which to launch ministry for generations to come; and, to renew our lives in commitment to Christ and his purposes! This vision will be fleshed out before our church family in many ways during the upcoming weeks as we together enter a capital campaign which has been entitled “Repay-Repair-Renew.” Our efforts will require hundreds of volunteers to be fully effective. Through the direct involvement of people like you, every member of Pittman Park will be given the opportunity to grasp the vision set before us by the Spirit of God. How can I make this experience holy? Today we enjoy the fruits of the labor of those who have gone before us. I am confident we will build on their tradition.